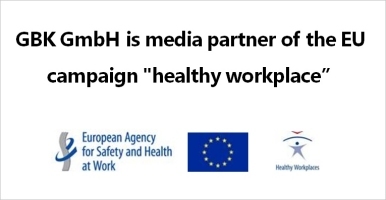 GBK GmbH Global Regulatory Compliance is now the official media partner of the Healthy Workplace campaign of the European Agency for Safety and Healthy at Work. The organization works to make European jobs safer, healthier and more productive – to the benefit of businesses, workers and governments. We are very pleased to contribute to these important topics with our expertise. – Awareness of the importance of risk prevention. – Promotion of risk assessments. – Awareness of the risks associated with occupational exposure. – Targeted consideration of employee groups with special needs and higher risks. Therefore, it is very important for us to address our customers and companies to the work safety and health at work area, as well as to exchange information and good practical solutions that serve the needs of the people.